Having a well-oiled, high functioning, paid search (PPC) strategy is a vital component of this growth, but just because you have a strategy it doesn’t mean that it is performing to its best. The following knowledge base will cover some of the things you can do to fine tune your PPC and put you in the best possible position to progress. Understanding your audience is vital and making sure that you are not wasting spend on those who are not at the right stage of the buyer’s cycle, or who are not even looking for your products and services is a must. You should be looking at your audience at all times and adapting your strategy in order to give your business the best possible chance of converting from an ad. In the world of PPC one of the most satisfying metrics is return on investment (ROI), if you can use personalisation and build truly bespoke ads that are well targeted then you are heading for success. ROI is determined by a number of factors and none more so than the actual spend. If you are going for a broad range of highly competitive keywords then you might find that the cost per acquisition (CPA) is very high. Making mistakes in terms of your targeting here could prove both counter intuitive and expensive. Keyword research is among the first steps to take when planning a PPC campaign. The end result of this can be a long list of keywords to explore, but do you really need to test them all? According to Searchenginewatch: “It’s tempting to try all of them until you find the most successful ones for your business, but it’s usually more effective to focus on the most important ones for your goals. “Quality keywords are not the same for every business or even every campaign, and this depends on what you want to achieve. These may not even be the most popular, but they will probably have more chances of converting than the rest. The additional time that you will have saved can be spent on maintaining lists. Look ahead and plan for new trends especially those picked up by consumers. You should also forward plan in terms of new products or services that you might be launching. Once you are pushing ads into the marketplace you not only want the basic details surrounding how many times they are clicked on but you want to know where the ads were seen and who clicked on them and when. This all relates to conversion tracking and making sure that you have it set up is a must. According to Google: “With AdWords conversion tracking, you can see how effectively your ad clicks lead to valuable customer activity, such as website purchases, phone calls, app downloads, newsletter sign-ups and more”. The main benefits of having conversion tracking set up and working is that it will allow you to gain a deeper understanding of you audience, where they are in the buyers cycle and where they are browsing and coming through to you site. This can lead to businesses reviewing their budgets and targeting their ads to a certain type of person in a certain location. Understand your ROI and make better informed decisions about your ad spend. Use Smart Bidding strategies (such as target CPA, enhanced cost per conversion (CPC) and target return on ad spend (ROAS) also) that automatically optimise your campaigns according to your business goals. See how many customers may be interacting with your ads on one device or browser and converting on another. You can view cross-device, cross-browser and other conversion data in your “All conversions” reporting column. Unless you’ve been living under a rock you will know that mobile optimisation is one of the most talked about topics when it comes to search marketing. Businesses are clamouring to follow consumer trends and optimising for mobile is a must. Failure to make sure that your ad displays properly or at all means the difference of hitting the entire potential audience or missing out on over 50% of them, (according to mobile v desktop usage). 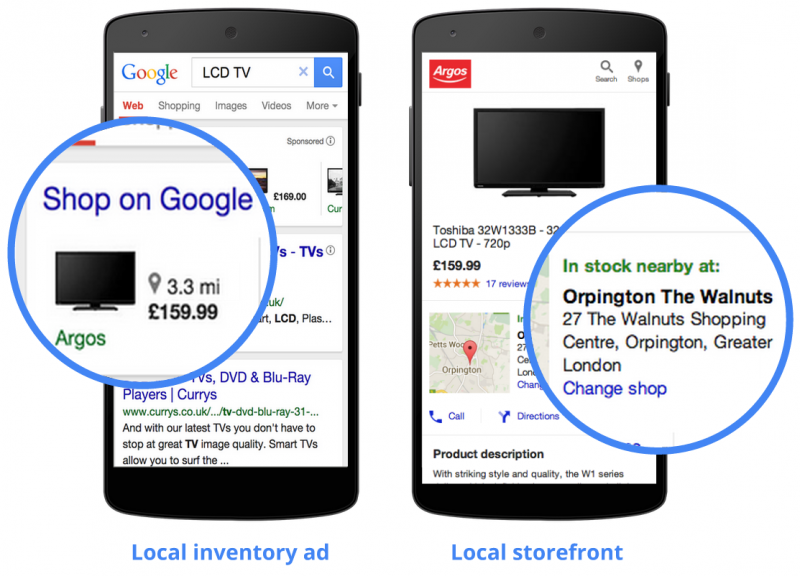 Another key thing when it comes to mobile optimisation is that you include local search. Search users are more likely to visit a store if they can see that a store has the product in stock. This is true whether researching a shopping trip on a desktop PC or a last minute search from a smartphone during a shopping trip. Recent Google research identified that 75% of shoppers plan to use their smartphone in store this festive season. As we have already touched on with the increase in mobile usage it is important to not only understand where your audience is looking but how and when. This was one of the topics covered by Click Consult’s Head of Paid Search, Dave Karellen at The Benchmark Search Conference. As you can see from the graphic above day parting is vital in terms of a paid search strategy. You need to be able to see when your audience are looking and on which sort of device. Desktop users tend to be most active in terms of search and clicking on ads during the middle part of the day, normally around lunchtime. Mobile users tend to be online during commuting hours and just before/after traditional work hours. Tablet usage picks up momentum throughout the day rising to its peak in the evening. 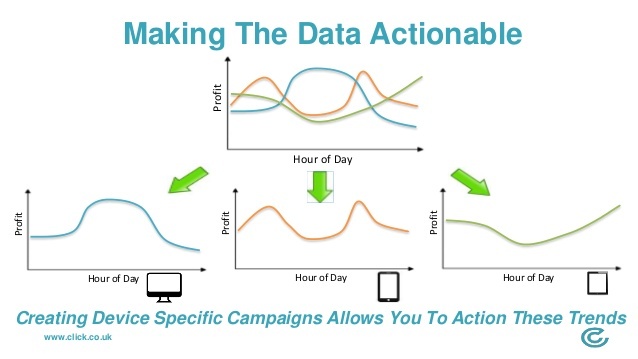 If you bear this in mind and target you ads, to certain devices and at certain times of the day you will reduce wasted spend and improve your chances of a higher ROI. 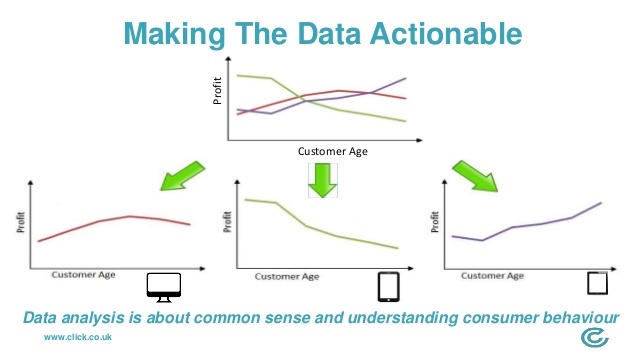 There is also an argument that a consumers age plays an important part in the targeting strategy. The number of smartphones us highest with the younger end of the market, whilst desktop usage remains fairly steady. Tablet use becomes higher with an older generation. If you are a business targeting one end of the market and you have relevant products for a particular demographic, then make sure you are targeting their devices at the time they are being used. A picture paints a thousand words or so they say. When it comes to writing an ad and implementing a PPC campaign many businesses think that they can choose to say anything. In the digital age it is not like taking out a full page, text heavy ad in a magazine. There are limits to what you can say in terms of Google AdWords rules. A trick to make sure that you are getting the most from you ads is to add relevant imagery. This could be in the form of a banner image with your promotion on or it could be a product shot. Use images to say what you can’t fit into the copy and display further benefits to the potential customer. The rule here is to check, check and check again. The most fundamental mistake that businesses make is linking the wrong information to their adverts. There is no excuse for putting in the hard work, designing eye-catching and informative ads and then linking them to the wrong place. If a buyer is genuine and they are interested in what is displaying there is a high chance that you will get a conversion following a click-through.